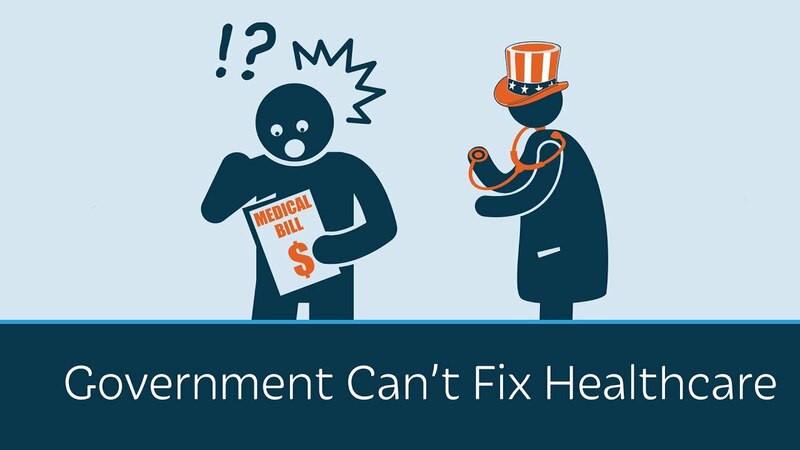 Why is the government so bad at healthcare? They’ve been at it for seventy-five years and still can’t get it right. It’s expensive. Access is spotty. It’s mired in bureaucracy. And it’s fraught with waste. Obamacare was supposed to fix all this, but instead, like every other government healthcare program before it, it just made things worse. Because the government is a third-party payer. Suppose you are going to buy something for yourself. You have two priorities: price and quality. You want the highest quality for the lowest possible price. Say you’re buying a television. You have many options: the size of the screen, the quality of the image, the price. Only you know which one best suits your needs and your budget. And a lot of companies are competing for your business. You do your research; you make your choice. This is called a first-party purchase – the person paying is the person using. Now, let’s suppose that either the price or quality is not controlled by you; in this case, you are buying something for someone else. You care about the price because you are paying for it, but you are a little more flexible on the quality. A good example would be a wedding gift – say, a coffee maker. You might think, by the time it breaks they’ll forget who gave it to them anyway…the cheaper one will be fine. All of us have bought things for others we never would have bought for ourselves. We care about the price because we’re paying for it, but not so much about the quality because we’re not going to use it. Or, suppose that we’re going to use something, but we’re not going to pay for it. Then we’re concerned about the quality because we’re consuming it, but the cost is not as important because we’re not paying for it. Any father who ever got roped into paying for an open bar at a wedding understands this program. Nobody ever orders the cheap stuff when it’s free. And now, for the coup de grace: when it is not your money paying for something, AND you don’t use it. Then you’re not concerned about either the price or the quality. Suppose the boss gives you $150 to buy a door prize for the office party. In a store window, you see a six-foot tall stuffed frog marked $149.00 You think, Oh, that’s perfect – let’s buy it. The raffle winner is awarded the six-foot frog. Everyone laughs at the gag. Now, this is called a third-party purchase – a purchase that is made with money that is not yours (therefore you don’t care about the cost) to buy something you’re not going to consume (therefore you don’t care about the quality). Here’s the point: By definition, all government purchases are third-party purchases. The government spends other people's money on things it won't consume. It doesn’t care about the price or the quality. Thus, there will always be waste in government spending.